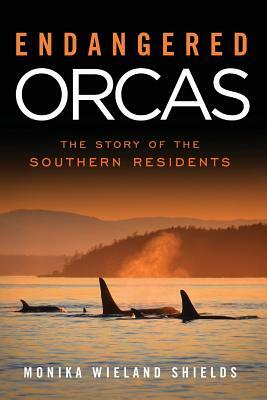 For Christmas I got a book entitled "Macrolichens of the Pacific Northwest". This was much to my brother's amusement, because while he advocates an envrionmentally-friendly lifestyle, he doesn't quite get my passion for learning about all things in the natural world, and couldn't imagine anyone being as excited as I was about receiving this book. I read the introductory chapter on lichens, which are really composite, symbiotic organisms containing a fungus and an algae, cyanobacteria, or both. I tried to start learning the complex anatomical features of lichen, but soon became lost among terms like apothecium, podetia, soredia, and squamulose. I figured it might be better to collect a lichen, then learn about the anatomy as I work my way through the detailed dichotomously-branching keys in the front of the book that let you narrow down what genus you're looking at. In college, I loved the biology lab we did where we had to use biological keys to classify species of plants. You look at the two options provided on the key - for instance, A) the plant has leaves in sets of four or B) the plant does not have leaves in sets of four - look at the plant in front of you, answer the question, then move to the next step in the key until you've defined the species you have. On first try, this proved much more difficult than anticipated with lichen, as many questions refer to teeny-tiny characteristics you need a hand lens to see. Other questions refer to chemical tests - for instance, what color does it turn when you dip the lichen in a K solution? I grew frustrated and tossed my collected lichen samples out. My best guess is that this species is Usnea wirthii. Surpisingly (okay, not really), most lichens do not have common names and are just referred to by their scientific name. 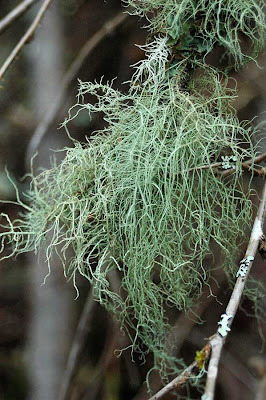 On top of that, many of the species classifications are unresolved, as is the case in the disordered Usnea genus. Most members of the genus (and there are thought to be more than 600 of them) are pale green, stringy, and grow off of bark or wood. Usnea can be differentiated from other similar genera by a white central cord that goes down the inside of the main branches, so you can imagine how excited I was when I found the white thread-like structure after breaking open one of the (very relatively) thick central branches and peering at it under the magnifying glass. I had less success with the identification of my second lichen. My best guess is Phaeophyscia orbicularis, but I only saw small patches of it and often you need large samples including the reproductive structures to make a final identification. Many people might ask, "Who cares about lichens? Why are lichens important?" In addition to providing food, shelter, and nesting material for a wide variety of wildlife, lichens are actually good indicators of local air quality. Many lichens will experience stunted growth or will stop growing in an area if the air conditions get too poor, so they can be important indicator species. in regards to air pollution. Some lichens are involved in nitrogen fixation for trees, or hold moisture which effects the temperature and humidity of local microclimates. Many lichens, including Usnea, have multiple medicinal uses. Many species of Usnea contain natural antibiotics or antifungal agents. With so many lichen species unidentified and the taxonomy unresolved, who knows how much more we might learn from studying lichens! Thank you for helping me to id this lichen, which is implicated in the the unhealthy condition of many Douglas fir, oak, and other trees in the northern california forests. I am trying to find out whether the lichen attacks only unhealthy trees or causes healthy trees to weaken and die. It appears that pieces of the lichen are spread around the forest by windstorms, but, curiously, it does not attach to the sequoia sempervirons.